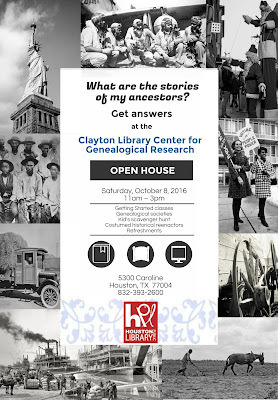 Please encourage your neighbors, friends and family to attend the Clayton Library Open House on Saturday, October 8, 2016. I will be there offering information about genealogical research on behalf of the Lonestar Chapter of the Association of Professional Genealogists. Please stop in and say hello. What are the stories of my ancestors?